Air plants (Tillandsia spp.) require no soil to grow in and make an exotic addition to indoor décor. They are a type of bromeliad, an ancient order of plants, and are found primarily in the tropical forests of world. Air plants are epiphytes, which are root-less plants with the ability to absorb moisture and nutrients through their leaves. In nature, they are found growing on tree trunks and boulders, but you can mount them on any dry object in your house, or even hang them from the ceiling. Air plants are hardy outdoors in tropical places (USDA zones 10 and 11), and can be moved outside in summer to grow on the trunk of a tree - or they can be grown indoors year round. They look absolutely prehistoric with their grey-green scaly foliage that looks something like the top of a pineapple. Most varieties are between four and six inches in size. 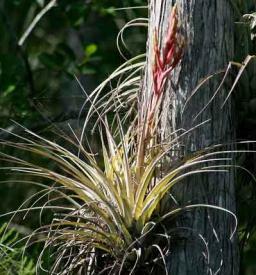 They occasionally produce a thin, multi-colored flower stalk that is major treat if it does occur, but air plants are primarily seen as a foliage specimen. 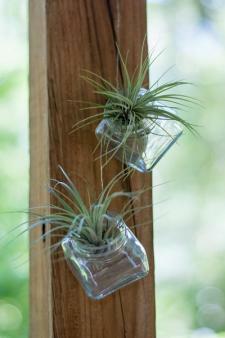 Air plants can be mounted to wood, cork, plaster walls or almost any dry surface, using glue or wire. They can be set right on the table or placed on a bed of decorative sand or tables. A popular approach is to place them in a glass terrarium with bits of moss, twigs, rocks and other decorative items. The key is to put them in a place with bright, indirect light, such as window with a southern, eastern or western orientation or a room with skylights. Florescent lights can be used as a source of supplementary lighting. 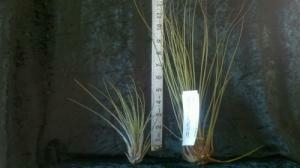 Moisture is the critical factor for air plant survival. They should never be allowed to stay wet, but they should be spritzed with a spray bottle two or three times each week. Alternatively, the entire plant can be soaked in water once a week for a half hour. It is not required, but air plants can be spritzed with diluted liquid fertilizer once a month to keep them healthy and encourage them to grow. Use a liquid house plant fertilizer and dilute it to about one-fourth the recommended dosage. As air plants grow, they will develop miniature versions of themselves at the base. These are called pups and can be cut and grown by themselves once they are about half the size of the mother plant. 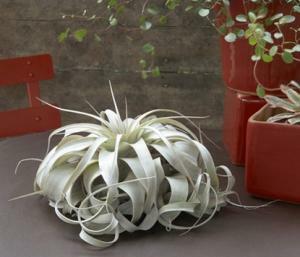 Air plants aren't susceptible to pests and disease, but they do need their growing conditions met to survive and thrive. If your air plant leaves start to curl or roll up, it is a sign of dehydration - simply give them a soaking in a tub of water and they should be fine. If brown or grayish spots appear on the leaves, it is a sign of rot, meaning the plants are too wet or air circulation is too poor, or both. Poor air circulation is generally only a problem in enclosed environments, like terrariums. In enclosed spaces, watering may only be necessary once per month. Nurseries sell air plants and they can also be found in some home décor stores. However if you can't find one locally there are many sources online. There are many species available, each with slight variations. All need a home indoors unless you're in USDA zone 10 or 11. 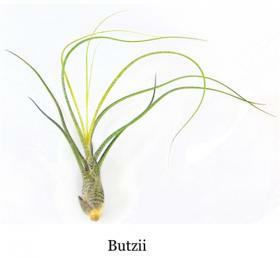 Tillandsia butzii is a variety with very fine, almost threadlike leaves. 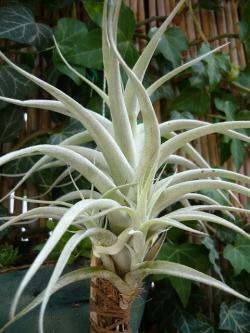 Tillandsia xerographica has silvery foliage and is much larger than most, growing over a foot tall and wide. Tillandsia aurejei has unusual elongated stems that creep and climb. 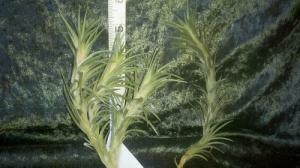 Tillandsia juncea has erect, grasslike stems up to 18 inches tall. Air plants defy what people think a plant should be. They can float on a piece of fishing line from the ceiling or live in an indoor rock garden - enough light and a tiny bit of moisture are all they need to survive.